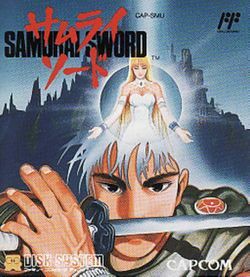 Samurai Sword (サムライソード, Samurai Sword?) is an adventure game developed and published by Capcom for the Famicom Disk System in Japan towards the end of 1988. The player is an unnamed hero who is promptly defeated by the game's antangonist Soron and whisked away before the moment of his demise in order to find a way to counter Soron's considerable magical might. While the game may resemble an RPG at first, it is actually a traditional Famicom adventure game, similar to Portopia Renzoku Satsujin Jiken or Princess Tomato in the Salad Kingdom. The player can select from a set of commands for the hero to follow such as looking around, talking to NPCs, picking up items and so on. While there are battles, they can only be resolved by finding the right command (often the right spell) rather than the standard RPG method of exchanging blows governed by various statistics. The game was never released outside of Japan. However, a fan-translation of the game into English was created by Mute and released in 2003. It can be found here. This page was last edited on 31 December 2014, at 04:04.